The grandfather of disabled Georgia boy whose missing case triggered a search of a New Mexico compound—where authorities found 11 children and arrested five people—said that the remains found on the property are those of the boy, CBS News reported. Officials have not yet identified the remains that were found this week. The boy, Abdul-ghani Wahhaj, would have turned 4 years old on Aug. 6, and officials allege that he was taken from his mother in Georgia last year. 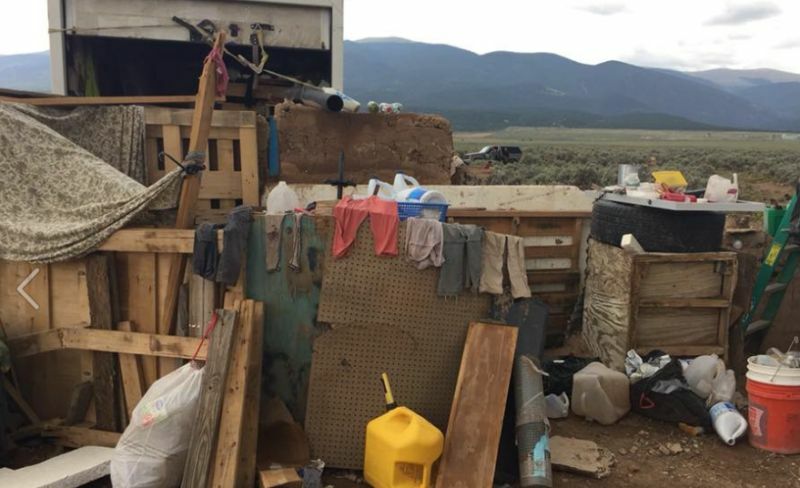 On the compound, in rural Taos County, 11 hungry children kept in filthy and squalid conditions were discovered. The compound consisted of a trailer partially buried in the ground surrounded by tires, pallets, and an earth-made wall. The boy’s grandfather, Siraj Wahhaj, a Muslim cleric in New York City, told CBS News that he thinks that the remains are of his grandson’s. Family members, he said, told him the information, but he didn’t know the cause of death. The boy’s father, Siraj Ibn Wahhaj, who is the imam’s son, was suspected of kidnapping the child. He was found heavily armed when he was found on the compound. Reports indicated that he wanted to perform an exorcism on the boy. The elder Wahhaj said that the 11 children found on the property were his biological grandchildren or members of his family via marriage. “I’m very concerned with the condition of my grandchildren,” he said, adding that he does not understand why his son disappeared into the desert with the children. He suggested that his son has psychiatric problems. “My son can be maybe a little bit extreme,” he told CBS. “High-strung,” he said. “We had learned the occupants were most likely heavily armed and considered extremist of the Muslim belief,” stated Taos County Sheriff Jerry Hogrefe in a release earlier this week. The elder Wahhaj’s mosque has drawn radicals in the past, including the man who tried to bomb the World Trade Center in 1993. “Wahhaj has espoused support for radical Muslim causes and was an unindicted co-conspirator in the [bombing],” states a 2011 training material for new FBI agents. He reportedly expressed a preference for an Islamic state over the American constitutional republic and also appeared as a defense witness at the trial of the “Blind Sheikh” Omar Abdel-Rahman, who was convicted in 1995 of plotting terrorist attacks in the United States. The elder Wahhaj didn’t respond to requests for comment. Naeemah Rashid Wahhaj said in a Facebook message that the family was not ready to talk and didn’t wish for her or anyone to talk either. Court records, meanwhile, revealed that the younger Wahhaj may have been training the children to commit school shootings. Authorities said during the raid on Aug. 3, that they had found the father armed with multiple firearms, including an assault rifle. They also said they believed there was a shooting range on the site.